Quite what to expect of Back To The Blues was impossible to guess in advance beyond it having an Indian hue. Below ‘Bagri Foundation presents…’ the concert handbill said, ‘In an evening of Indian contemporary music Carnatic legend Aruna Sairam collaborates with sarod virtuoso Soumik Datta, to evoke a haunting and sensory world.’ Given that Aruna Sairam is a Chennai-based Carnatic vocal virtuosa and Soumik Datta is the rising British Indian sarodist, a fusion project of some kind was on the cards. A quintet took the stage. The other musicians recruited for this specific project were all London-based. Cormac Byrne’s entrée was through working with Datta. He played hand percussion, particularly Ireland’s bodhrán frame drum. In 2017 they worked together on King of Ghosts, with the City of London Sinfonia, at the Sam Wanamaker Playhouse delivering the sarodist’s alternative score for Satyajit Ray’s fantastical film Goopy Gyne Bagha Byne. (Ray had composed the original in 1969 so Datta’s newly minted score differed, say, to Anoushka Shankar’s soundtrack for the restored silent film Shiraz: A Romance of India last year, now streaming on the BFI Player.) The keyboardist Al MacSween, with Giuliano Modarelli co-head of the extraordinary Kefaya collective, tickled the ivories of the Steinway concert grand. Last, Pirashanna Thevarajah brought mridangam, ghatam and morsing to the bash. It was a similar assortment of percussion and dexterity to what he played on Anoushka Shankar and Karsh Kale’s Breathing Under Water (2007) and her Traces of You (2013). The opening piece ‘Chakkani’ (a Telugu word with ‘nice’, ‘fair’ and ‘handsome’ connotations) introduced the musicians. The prelude was Aruna Sairam singing syllables to a shruti box tonic. After a couple of minutes, sarod, lyrics, finger cymbals and mridangam and piano joined in. They created a slow, relentless build that concluded with chiming finger cymbals. Before the next piece of music, ‘Pakkala’, Datta explained ‘the process’ had begun with a few Skype conversations. The real work had begun in London, although, trivia fans, the headliners had broken off from rehearsals two evenings before to attend the first half of Niladri Kumar’s concert Seduced by the Sitar. As for the ‘what’s in a name?’ blues of the title, it was, he explained, “a metaphor for my roots” and connected ‘common roots’. Incidentally, they skimped on announcing titles. Only the first encore came perilously close, though. Other songs dipped into Maharashtra’s Sangeet Natak bran tub and, for the first of two encores, into thillana with ‘Kalinga Nartana’. By convention, this highly rhythmic song form is generally performed at the end of a concert or as a dance piece, since it depicts Lord Krishna defeating the naga (serpent being) Kalinga or Kaliya by dancing on his heads. She has made this signature piece, by the 18th-century Tamil composer Oothukkadu Venkatasubba Iyer, all her own. (The Oothukkadu part merely name-checks the hamlet in the Thanjavur district of modern-day Tamil Nadu where he lived.) The quintet kept it tense and taut. Overall, Back To The Blues was a project that benefited from a few days’ rehearsals rather than winging it in public. Thevarajah and Byrne’s blend of sonorities worked extremely well and the rhythmists’ two traditional approaches to percussion found common ground and complemented each other superbly. The combination of Datta’s Hindustani short-necked lute and MacSween’s pianistic flurries and sweeps meant the melodic palette captured the imagination. 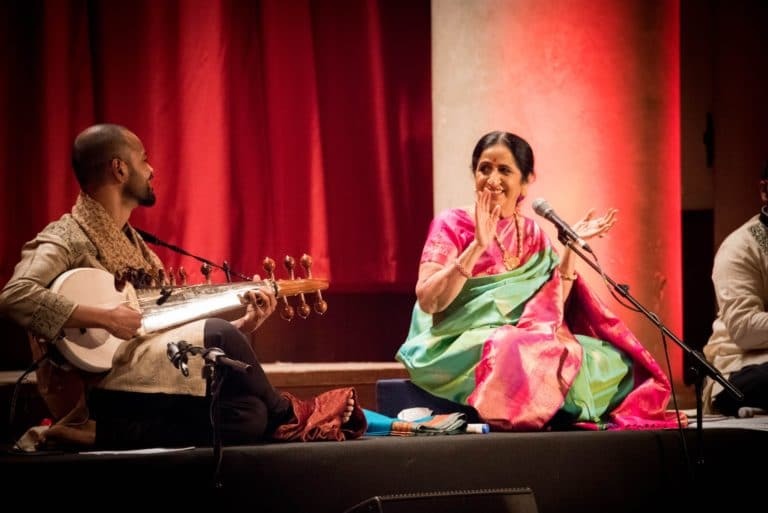 And Aruna Sairam confirmed why she remains a musician to cross national borders to see perform in concert. Back To The Blues is a work of rare imagination deserving to be taken to new places. Doff caps to the Bagri Foundation for having the philanthropic vision to make this suite of music happen. © Copyright 2019 Bagri Foundation.